During the course of the shows and events that we put on, we have probably heard the term “POISONOUS SNAKE” more times than we can count. That said the term is also said on the news, used in books, spoken in classrooms, and is often even mentioned on popular and trusted television networks like Animal Planet, National Geographic and Discovery Channel. Despite the incessant use of this phrase, it is enough to make herpetologists and snake enthusiasts cringe. You see, what many people do not know or understand, is that (with the exception of one noteworthy example, which we will address later) snakes are NOT POISONOUS. However, some of them are VENOMOUS. 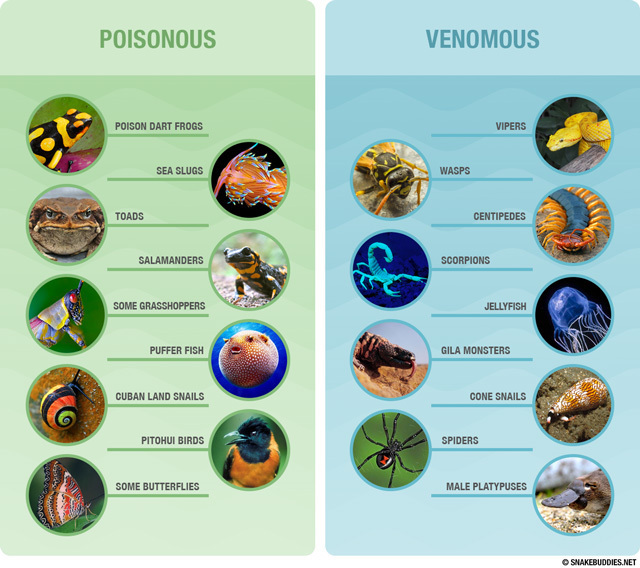 Believe it or not, there is a very fundamental difference between POISON and VENOM, which we would like to share with you. The two words are not interchangeably synonymous. Sure, the potential result of exposure to either of these toxic substances can make you equally dead, but the real difference is all in the delivery. 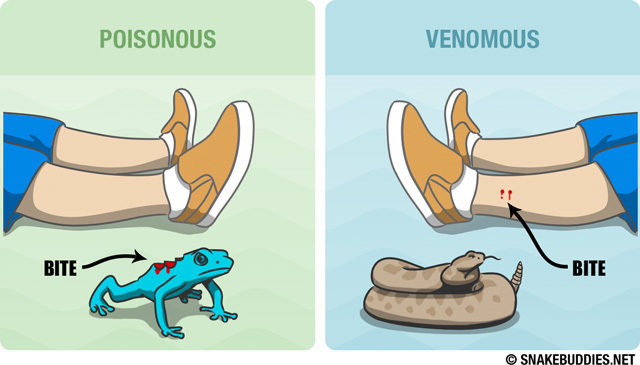 The difference between POISON and VENOM is actually quite simple. 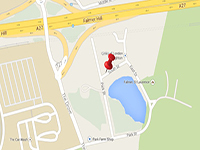 POISON is ingested (eaten), inhaled, or absorbed into the bloodstream through direct contact. VENOM however, is produced in a gland, and injected into you, via a flesh-piercing fang, stinger, barb or spine. Below, is a list for you to review, in the event that you are still unsure which animals qualify as VENOMOUS, and which are POISONOUS. Some of the culprits in each category are pretty obvious, while others may be a bit surprising. Did you know for example, that there was a poisonous species of bird, or that the cute little Platypus (males only) possess an extremely painful venom, delivered by a sharp spur on their back legs. This brings us to the “noteworthy exception” I mentioned above, regarding snakes. Leave it to Mother Nature, to keep us on our toes. 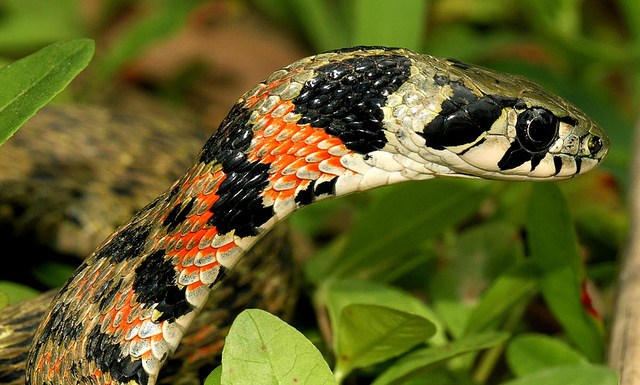 The Tiger Keelback of Eastern Asia has been known as a rear-fanged colubrid with a VENOMOUS bite for some time. However, in recent years, scientists have discovered that it is not only VENOMOUS, but that it also has glands located behind its head, which can secrete a POISON, making this snake both VENOMOUS and POISONOUS! Interestingly, this snake does not produce its own POISON, but sequesters it from the toads it eats, and stores the toxic fluid in the glands behind its head. When threatened by a predator, the Tiger Keelback will rear up, and keep the back of its neck closest to its attacker. If the predator bites the snake, it will get a mouthful of bad-tasting, and eye-irritating toad toxin. I would like to say thank you to Snakebudies.net for the use of their article and pictures you can see their entire article at Snakebuddies.net.